Looking for more TV shows like This Is Us that will make you laugh and cry, sometimes in the same breath? The show was pretty much an instant hit ever since the moment it aired back in September. In fact, it’s such a hit that the network picked it up for another two seasons! That rarely happens for new shows. I think the success comes from the fact that while it’s primarily a drama, it has enough funny moments to keep us from melting away into a pile of tears every week. Check out a few other shows like This is Us that do the same. This post contains affiliate links. This Is Us is a drama television series that premiered on September 20, 2016, on NBC. The series showcased the lives of Rebecca and Jack Pearson, parents of fraternal twins Kevin and Kate and adopted son, Randall. This Is Us stars Mandy Moore as Rebecca, Milo Ventimiglia as Jack, Justin Hartley as Kevin, Chrissy Metz as Kate and Sterling K. Brown as Randall. 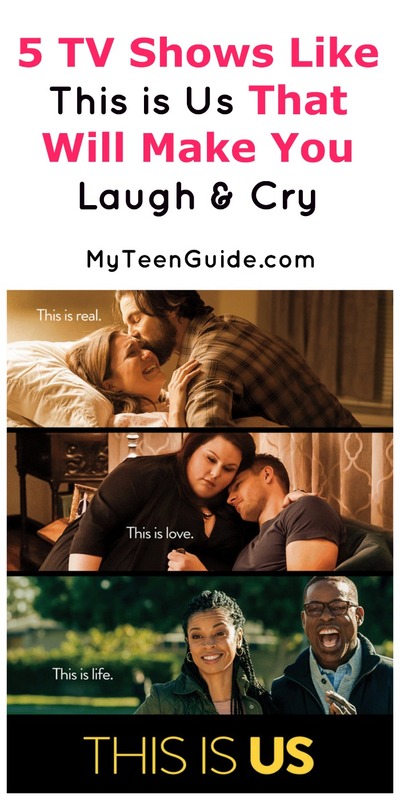 Here are more some great TV shows like This Is Us. Better Things is a comedy television series that has aired on FX for 1 season, premiering on September 8, 2016. The series focuses on an actress, Sam Fox, as she is trying to juggle the pressures of Hollywood life and being a single mother to her three kids: Max Fox, Frankie Fox, and Duke Fox. Better Things stars Pamela Adlon as Sam, Mikey Madison as Max, Hannah Alligood as Frankie and Olivia Edward as Duke. Speechless is a sitcom television series that has aired on ABC for 1 season, debuting on September 21, 2016. The series focuses on the DiMeo family, each with their own unique personality. The family consists of parents Maya and Jimmy as well as their three kids: Ray, JJ, and Dylan. Speechless stars Minnie Driver as Maya, John Ross Bowie as Jimmy, Mason Cook as Ray, Micah Fowler as JJ and Kyla Kennedy as Dylan. Modern Family is a mockumentary television series that has aired on ABC for 8 seasons, premiering on September 23, 2009. The series surrounds three families that are interrelated to Jay Pritchett, the family patriarch. Jay lives with his young wife, Gloria Delgado-Pritchett and her son from a previous marriage, Manny Delgado. Claire Dunphy is Jay’s daughter and resides with her husband Phil Dunphy and their three kids: Haley, Alex, and Luke. Lastly is Mitchell Pritchett, Jay’s son who lives with his husband Cameron Tucker and their adopted daughter Lily Tucker-Pritchett. Modern Family features the cast of Ed O’Neill as Jay, Sofia Vergara as Gloria, Rico Rodriguez as Manny, Julie Bowen as Claire, Ty Burrell as Phil, Sarah Hyland as Haley, Ariel Winter as Alex, Nolan Gould as Luke, Jesse Tyler Ferguson As Mitchell, Eric Stonestreet as Cameron and Aubrey Anderson-Emmons as Lily. Parenthood aired for six seasons from 2010-2015 on NBC. Like This is Us, it was almost an instant hit among critics and TV viewers alike. The series followed the life and trials of the Braverman family, the ultimate close-knit clan. It was based on a 1989 movie, but while that film was mostly a comedy, Parenthood included a mix of drama and comedy to keep viewers tuned in. The Real O’Neals is a sitcom television series that has aired on ABC for 2 seasons, premiering on March 2, 2016. The series focuses on the O’Neal family, a close-knit Irish family living in Chicago. The O’Neal family consists of parents Eileen and Pat and their three kids: Kenneth, Jimmy, and Shannon. The Real O’Neals stars Martha Plimpton as Eileen, Jay R. Ferguson as Pat, Noah Galvin as Kenneth, Matthew Shively as Jimmy and Bebe Wood as Shannon. Do you have any other favorite TV shows like This is Us? Share in the comments!